You are here: Home / Furminator / My honest review of the FURminator. Is this cat brush any good? I usually use a standard brush on my cats mostly to give them a good massage, and although there was hair left on the brush, there never was a large amount. So while searching on Amazon, I came across this brush with tons of reviews called quite simply… The FURminator. The name sounded impressive but so did the reviews. 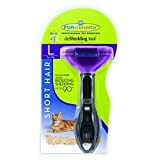 I mean with over 2,500 people bothering to leave a 5 star review, this cat grooming or deshedding tool (whatever you may call it) must be pretty good. So I decided to try it out and see the results for myself. And man, was I impressed. This is like a cat brush on steroids. A better description would be that this product is like a freaking vacuum for cats. Also, I thought I should mention this. I’ve had the FURminator for over a year and just recently decided to write this review. So if you’re wondering why my brush looks different to the one on Amazon, it’s because I may have the old one. But it still works pretty damn good. Now, I have four adult cats and four kittens, they’re about two months old. With that many cats I’m used to my clothes being marked by cat hair. The price did seem a bit strong but I decided to order it to see if it really works how it’s described and I was pleasantly surprised (as mentioned above). I wasn’t even aware that I could get so much hair out from a single cat, it made me flashback to when I had a really fluffy dog. Although it may not look like much hair in the image above, keep in mind that I used the FURminator on Snowy last week after I had bathed her. So I prefer black clothes, which is a deadly factor for any cat owner. Sure, there are some hairs left when I pick them up after using the FURminator, but nothing that requires a sticky roller session. I honestly didn’t realize my short haired cats could shed so much. One of my cats has longer hair and I got a decent pile after introducing her to the product. If you have a cat with longer hair I’d suggest getting the long-hair version of the FURminator (which is what I have… I think). From what I can tell it’ll cover both long and short hair, unless you have a cat with a very short coat. Also, don’t use it too often. Brush her a few times and give it a break. From what I can tell, it does scrap the cat’s hair a bit, much like when you comb your own hair. You’ll always find some hair on the comb, but this being a more dense product it will gather a lot of hair every time you brush your cat. Just do it every once in a while to control the cat shedding and prevent hair loss. It’s also far less work for you. As far as the product design goes it’s very comfortable to use (totally loving the grip on the handle), a lot different than a standard brush. The huge plus is the button that releases the hair. I always had to spend several minutes ripping them out of the brush, with this feature it takes a second. The cats love it, one of them starts playing with it whenever I try to brush the belly, but doesn’t run away. As long as you don’t spend too much time brushing the key areas of your cat’s body, she shouldn’t protest. The price seems higher than an average brush would good. But that’s probably because this product is far superior than a regular brush. For some strange reason, I was expecting batteries or something more complex but it’s fairly simple. My cats usually keep a clean coat so I don’t have to clean much before brushing. Bear in mind the brush is very dense so make sure there are no obstacles in the hair that might get stuck. I don’t bathe my cats but if you do, it’s best if you comb a washed and dried coat. Okay, so I thought I should include this in the article. I ran into a concern in the reviews about the products ordered from Amazon being counterfeit. As long as you order directly from the FURminator products dispatched by Amazon and not a third party you should be fine. Basically if you’re reading this comment you’re safe to order the product. Should you buy this cat grooming tool? I buy a lot of stuff from Amazon. This is honestly one of the best, if not, The Best cat brush I’ve ever used. The amount of fur that comes out by using this thing is ridiculous. I highly recommend you pick one up and try it out for yourself. I guarantee that you’ll be pleasantly surprised. *I’ve been receiving a few emails on the type of camera I’m using. It’s the Canon EOS Rebel T3i with this lens (invest in some good lens so you have less editing to do after). I want you to know that I’ll earn a very small commission if you decide to click on one of the product links above. However I never recommend something I’ve never fully used. If you do feel uncomfortable with that, feel free to just open up Amazon on your browser and manually type in the product name.